Family Rosaceae Juss., genus Sorbus L.
Forms: pyramidal - f. fastigiated (Loud.) Hartw. et Rumpl., weeping - f. pendula (Kirch,) K.Koch, sweet or Moravian - f. edulis Dieck., Russian - f. rossica Spaeth, Beisner - f. Beissneri Rehd., Fifeana - f. Fifeana Dipp., variegated-leaves - f. aureis hort. Sorbus caucasigena Kom. ex Gatsch., S. glabra (Wimm. et Grab) Hedl.p.p., S. gorodkovii Pojark., Pyrus aucuparia Gaertn. 2n=34. Deciduous tree 6-15 (17) m in height with ovate-shaped crown, or high shrub, with smooth, grey bark. Leaves alternate, large, 15-20 cm in length, odd-pinnate, with 9-15 (17) lanceolate leaflets 3-5 cm in length, 1-1.5 cm in width, with serrated edges and pointed top, mat-green upper leaf surface, light bluish gray lower leaf surface. Flowers white, 1.5 cm in diameter, with specific smell. Inflorescence is tight corymbose 10 cm in diameter, on shortened stalk. The corymbose consists of 6-500 fruits. They are apple-like, spherical, 0.7-0.8 (1.5) cm across, bright red or red-orange, soft in mature state, bitter-sour, astringent, with 2-5 seeds. Mass of 1000 fruits 120-723 g. Flowering occurs in May-June; fruit-bearing occurs in September. There are many garden forms and hybrids. As a wild species, this plant grows in forest and steppe-forest zones of European Russia, Crimea, and the Caucasus. Its area extends to 70° northern latitude and 50° eastern longitude. Since the 18th century, it has been cultivated on green plantations and in woodland belts; since the end of the 19th century, it has been cultivated as a food plant also. Grown in practically all regions of the European region of the former USSR (excluding the extreme north and south regions), in forest and forest-steppe zones of Siberia, in mountainous regions of Central Asia, and in central and southern parts of the Far East. Often grown in woodland belts of the central and northern parts of forest zones. Undemanding with regard to environmental conditions. Frost-resistant species, bears frosts as cold as -50°C. Drought-resistant. Prefers sufficiently moist soil. Does not tolerate peaty-boggy, salinized, or dry soils. Relatively shade-tolerant, high-growing plant. Fruits contain 4-9.5% sugar, 2.7% organic acids, pectins, tannins, vitamin C (200 mg per 100 g), carotene (20 mg per 100 g), and vitamin P. Fruits are edible when fresh or after freezing and are used in the preparation of liqueurs. Dry fruits are used as a vitamin-rich remedy. Flowers and fruits are used in folk medicine. Productivity reaches 5.2-20.8 tons per hectare. Wood is used for making musical instruments. Trees grow in woodland belts, preventing erosion along river banks. Ornamental plant. Good honey plant. It is also used as a stalk for quince and pear. Borodina N.A. et al. 1966. Trees and shrubs of the USSR. Moscow-Leningrad: Mysl., 638 p.
Burmistrov L. 2000. European mountain-ash: Handbook of gardener. Ed. A.A. Yushev. St. Petersburg: Lan., pp. 274-280. Grozdova N.B., Nekrassov V.I., Globa-Mikhailenko D.A. 1986. Trees, shrubs and lianas. Moscow: Lesnaya promyshlennost., 350 p.
Kochegarova N.L. 1986. Diversity of forms of European mountain-ash and selection of household-valuable forms for ornamental and food purposes. Briansk: Briansk technological institute, 17 p.
Malahovets P.M., Tisova V.A. 2002. Ornamental trees and shrubs in the North. Archangelsk: Archangelsk technical institute, 128 p.
Mal.tseva A.N., Alekseev-Malakhov G.A. 2002. Ornamental trees and shrubs: landscape design and planting of greenery in plots. Rostov-na-Donu: Pheniks, 192 p.
Petrova I.P., Borodina N.A. 1992. 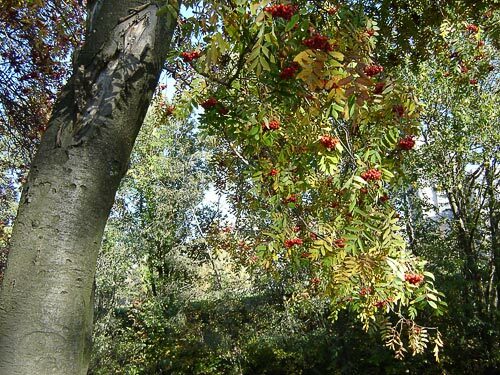 European mountain ash. Totals of introducing in Moscow. Moscow: Nauka, 120 p.
Plotnikova L.S., ed. 1990. Woody plants recommended for Moscow greening. Moscow: Nauka, 160 p.
Rychin Yu.V. 1959. Trees-shrubs flora. Moscow: State education-pedagogical publisher of Ministry of education of RSFSR, 292 p.
Vehov V.N., Gubanov I.A., Lebedeva G.F. 1978. Cultural plants of the USSR. Moscow: Mysl., 336 p.
Vitkovsky V.L. 2003. Fruit plants of the world. St. Petersburg; Moscow; Krasnodar: Lan', 592 p.
Vstovskaja T.N. 1986. Woody plants - introduction to plants of Siberia. Lonicera-Sorbus. Novosibirsk, Nauka, 288 p.